Writing a novel as if it were a podcast makes for some suspenseful storytelling. True crime has taken over entertainment. Regardless of what that says about our society, observe the fruits of this trend has been fascinating. It’s a pick-your-poison landscape now, filled with riveting podcasts, multi-part streaming series, and other mediums exploring (or exploiting, depending on your view) our interest in the horrible things that happen to others. Amidst the plethora of experiments, one stands out as a refreshing take on the trend: turning the true-crime podcast format into a fictional book. At its core, podcasting is just another way to tell stories, and British author Matt Wesolowski took that idea and translated it into book form. 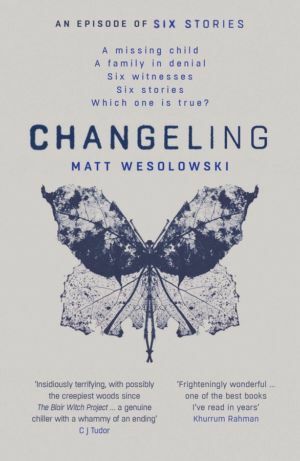 Changeling, the latest installment in Wesolowski’s Six Stories series, successfully implants the tale of a boy’s disappearance into your head vividly enough that you can almost hear it being told to you. For those unaware, the Six Stories book series uses a podcast format to “rake over old graves” of fictional crimes. Journalist Scott King hosts the fictitious Six Stories podcast, in which he explores past crimes by interviewing those associated with them—witnesses, bystanders, and perpetrators alike. Each book in Wesolowski’s series features six stories and six different accounts of the same crime, written as podcast transcripts. Reading each book mimics “listening” to one season of the Six Stories podcast, with King as your narrator and guide to dissecting the events that led to and made up the horrible (and typically mysterious) crime at hand. Changeling is the third “season” of the Six Stories series and fictional podcast, but I’d say that books one and two (Six Stories and Hydra, respectively) aren’t necessarily required reading before jumping into the story of Alfie Marsden’s disappearance. On Christmas Eve 1988, the seven-year-old boy vanished from his father’s car as it sat with a flat tire on the Wentshire Forest Pass in an unnamed area of the UK. Alfie’s father, Sorrel, left his son in the car to go find help but returned to an empty back seat. Despite years of searching, Alfie’s remains were never found, and he was pronounced dead in 1995. Scott King decides to take on the case after receiving numerous letters urging him to look into Alfie’s disappearance. This season of Six Stories” follows King’s struggles, both internal and external, in finding and interviewing those connected to Alfie—including the boy’s charming, concerned father, his damaged alcoholic mother, and a strange psychic that claims to know more about the Alfie Marsden case than anyone. Each Six Stories installment has an element of horror, and Changeling is no different. The legends and lore surrounding the Wenshire Forest offer the most obvious sources of horror, including stories of sinister fairies and the feared Wenshire Witch. Guessing the ending a few pages before it happened didn’t take away from my enjoyment. Wesolowski is a master of atmosphere, managing to make the myth of the Wenshire Witch—known by most adults as a story to scare little children into obedience—feel ominously real. One interviewee takes readers through an incident during a horrifying camping trip that’s believed to have changed Alfie for the worse. Wesolowski’s dark descriptions of the seemingly self-aware forest make it so readers can almost hear the menacing tap-tap that often precedes disturbing events that happen in Alfie, Sorrel, and mother Sonia’s life. But monsters aren’t just things of the woods, and that’s really what this book is about. Wesolowski artfully uses paranormal, supernatural, and fantastical forces to show just how close we typically are to the scariest monsters of them all—the toxic and often manipulative people in our own lives. Our minds have the power to take the seeds of the uncanny, the terrifying, and nurse them into thick forests of dread, and Wesolowski understands that. Like Six Stories and Hydra, Changeling takes what could have been a fairly straightforward disappearance story and turns it into a nerve-prickling one by giving readers just enough information to form their own assumptions about what happened to Alfie Marsden. Hearing bits and pieces of that story told through different voices heightens the anticipation of figuring out the end. While reading, you might even forget that you already know the “end” of Changeling‘s story: Alfie Marsden is gone and no one knows what happened to him. That peculiarity is unique to all three Six Stories installments, and yet Wesolowski’s writing style still makes you believe there’s more to discover. 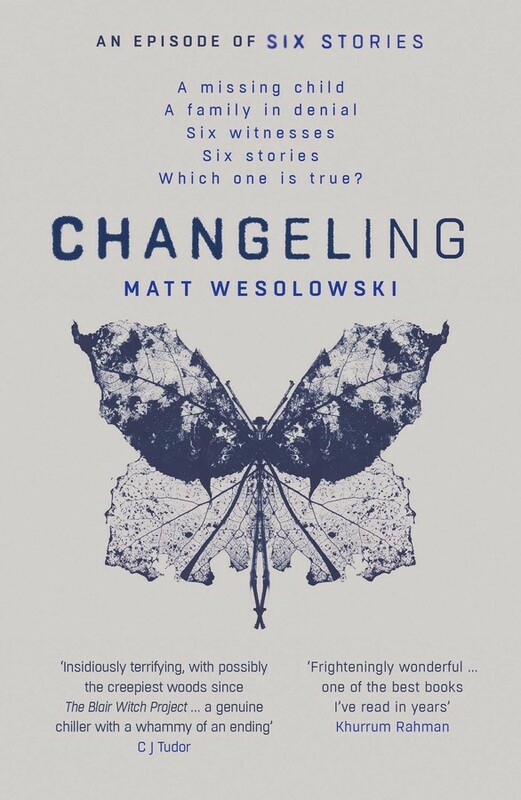 While you don’t need to read Six Stories and Hydra before reading Changeling, doing so will set the tone for the latest installment and give you a better sense of how narrator Scott King operates (and all the woes he experiences because of it). I also believe that if you pick up on the right clues, you may be able to guess the serious twist at the end of Changeling. That would normally be off-putting for me, but guessing the ending a few pages before it happened didn’t take away from my enjoyment of the book. Quite the contrary: the twist is shocking, and, much to my preference, it answers a big question while raising many others. Inspired by the popular podcast Serial, Wesolowski wanted to see if that same format could be achieved in novel form. Six Stories was the product of that experiment and proved that, not only could the podcast-as-a-book format be produced without feeling like a gimmick, but it could also spice up a relatively basic murder mystery. Fans of Six Stories and Hydra will eat up Changeling, and new readers will be engulfed in its hair-raising atmosphere, intriguing plot, and just-plain-good storytelling. Changeling is published by Orenda Books and available now as an e-book from Amazon and other retailers. The paperback and audiobook versions will be available on January 15, 2019.